And now a quick jump to the early 13th century... My last request from a friend was to write a letter from the alcaide (municipal magistrate) of Algoso, a castle in northeast region of Portugal, to be delivered to the Archbishop of Toledo along with the arrival of portuguese troops to aid in the battle of Las Navas de Tolosa (1212), an important turning point in the iberian Reconquista. Originally there is no proof that such letter had ever been written, but the document will be presented to the archbishop in the arrival of portuguese participants in the event - the 800th anniversary of the Las Navas de Tolosa, by a group of friends who will attend the recreation of the battle in Spain. Now, a historical curiosity for our dedicated readers (we know who you are! :D). 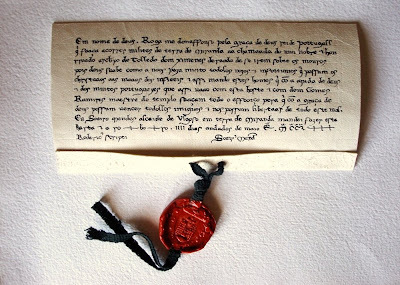 Until 1422 all documents in Portugal were dated with the Caeser Era, or Hispanic Era. In the beginning of the Pax Romana in Hispania, a new dating system was set and the year 1 of Caeser Era corresponds with 38 B.C. So, until late middle ages, the iberian kingdoms used this system, and Portugal was one of the last converting to the Anno Domini system by a royal decreet of King John I in August 22, 1422 (or, Era MCDLX). For example, in the letter above, altough the battle was in 1212 AD, the document reads "written in Era (of Caesar) MCCL" - Era of 1250 (1212 + 38). Below, two original documents, the first from August 12, 1422 (before the royal decreet) in wich can be read in the last line "era de mill & iiii xl anos" (MIIIIXL) = Era of 1460 - and another from September 11, 1422 (after the royal decreet), in which can be read "era da nascença de nosso senhor Jhu Xpo de mill e iiii xxii anos" (MIIIIXXII) - Year of the birth of our lord Jesus Christ of 1422". 1422, Agosto, 12, Óbidos – O infante D. Duarte esclarece algumas dúvidas colocadas por Vasco Fernandes de Távora e Armand Boutin, respectivamente anadel-mor dos besteiros do conto e escrivão da anadelaria-mor, sobre o recrutamento dos besteiros do conto. 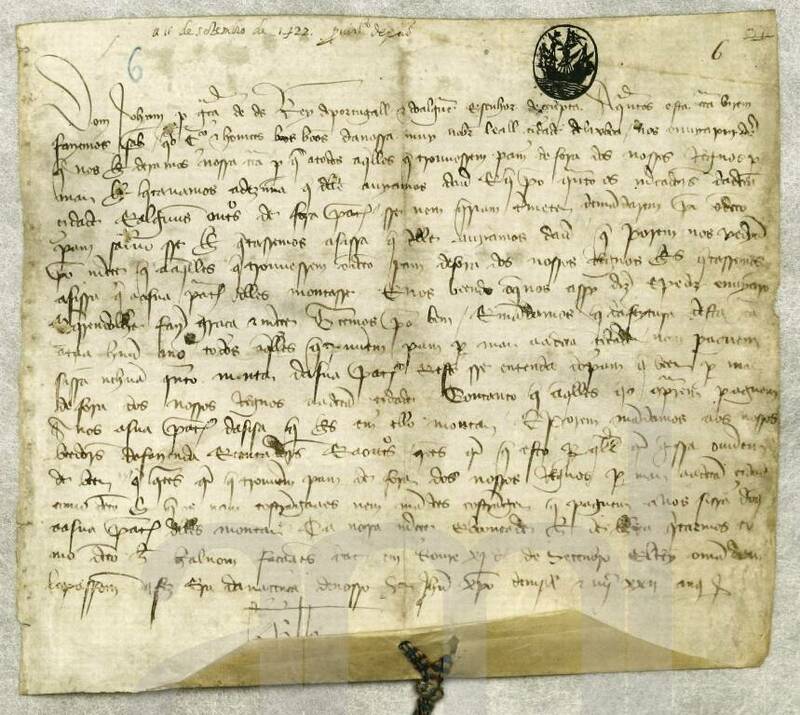 1422, Setembro, 11, Soure21 – D. João I, a pedido do concelho de Lisboa, isenta do pagamento de sisa, durante um ano, todos aqueles que trouxerem cereais para vender na cidade.